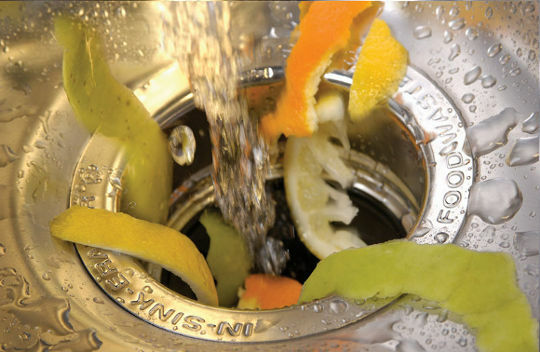 For many homeowners, a garbage disposal unit is an absolute must-have feature in a kitchen. This handy appliance works to chew up all your food scraps and feed them down the drain. It makes clean-up simple and fast, and from an environmental-standpoint, it means you’ll be creating less waste in the landfill. While these units tend to be real work-horses in the kitchen, they can act up from time to time. Here we’ll take a look at some of the most common issues that can happen, and how you can go about fixing them. This is perhaps one of the most common complaints people have. If you flip your garbage disposal unit on and just hear humming, there’s a good chance some food has become lodged in there. What this means is that you need to remove it. This is a relatively simple DIY job that anyone can do. Begin by unplugging your unit so it no longer has power coming into it. Next, check to see if it has an Allen wrench attached to it, which most do. This is the only tool you’ll need for this repair. It’s now time to inspect the blades to see if there are any foreign objects stuck in between. If there is, just remove them so the blades can start moving again. Plug the unit back in and the problem should be solved. You can find more in-depth instructions and other helpful tips at mrgarbagedisposal.com. If you turn on the garbage disposal unit and it doesn’t do anything, not even him, then it could be that it has overheated. The most common reason these units to overheat is that they have been overfilled. Once this happens, the unit trips itself and won’t work. You will want to examine your unit and look for a reset button, which is usually red. Press this button and see if that does the trick. If it still won’t work, then likely you will need to check the breaker in your home’s circuit box. If it seems like your garbage disposal unit isn’t doing a great job grinding food, it could be that you need to examine what you’re putting in it. There are a number of items that don’t belong in a garbage disposal unit and that can cause a lot of damage. These items include glass, bones, eggshells, coffee grounds, rubber, fibrous foods, and metal. Each of these can result in clogs. As well, you need to be running cold water each time you use your garbage disposal unit. These simple repairs and tips should help you to ensure your garbage disposal unit remains in tip-top shape. If you have tried each of these solutions and the unit still isn’t working, then it’s probably time to call in the repair person.